Back in March, I expressed my concerns about director Juan Solanas’ sci-fi romance film UPSIDE DOWN (2013). It didn’t help that reviews of it were less than positive. Therefore, I wasn’t in a rush to see it in the theater. When the film showed up on Netflix, however, I decided to give it a shot. This post will include some spoilers so I can best explain why it didn’t work for me. The upside is that UPSIDE DOWN is *definitely* a science fiction romance film. No doubt about it, when it comes to SFR content, the film’s heart is in the right place. It's even got a great tagline: "What if love was stronger than gravity?" The downside—and it’s a big one—is that the film fails on multiple levels. I don’t even know where to start, quite frankly. I’ll tackle the setting first. UPSIDE DOWN is certainly a pretty film to look at. Some might even describe it as gorgeous. It’s a high concept idea with an easy-to-grasp premise: two opposite worlds locked in an embrace by gravity. The “Up Above” world is prosperous, while the “Down Below” world is dystopian in nature. One of the problems, however, is that in the beginning, the film sets a reader up to expect hard SF elements. There’s a lengthy info-dump at the beginning (not unlike some hard SF novels) and a clear attempt at presenting the science in a plausible way. Unfortunately, the film veers off into science fantasy and is inconsistent regarding the laws of physics. Also, a skyscraper-type building, owned by the evil corporation TransWorld, connects the two worlds. Subsequently, we’re asked to assume the two planets rotate at exactly the same speed. Because otherwise the building would be torn apart. So there was quite a bit of handwavium as far as the hard SF elements. 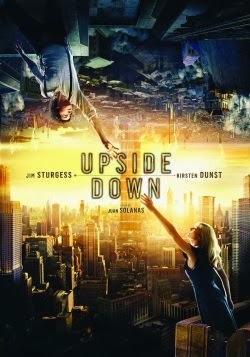 I think UPSIDE DOWN would have been better served as being science fantasy right from the beginning. The romance plot can be summed up as hero meets heroine, hero loses heroine, hero pursues heroine, hero finds heroine. The romance is of the forbidden nature kind, like Romeo and Juliet, because people from the two worlds aren’t supposed to develop relationships. How the Up Above world regulates such a Draconian law isn’t clear, except for the fact that gravity prevents citizens of either world from easily traveling between them (for example, gravity would constantly pull someone from the opposite world toward the ceiling). That’s leaving a lot to chance, which made me question the intelligence of the Up Above leaders. The film is also very clear about the soul mate component. Like I mentioned earlier, it’s very pro-SFR. The hero and heroine meet as children, but the plot quickly jumps forward in time to reveal them as romantically involved adults. The shift from kids to adults gave me whiplash. I can’t even tell you what qualities they see in each other. They meet and fall in love because they’re forbidden to do so, I suppose. We learn plenty about Adam, but Eden has zero backstory. It’s scary, actually, how little we know about her. She’s more of a possession for Adam to acquire, marry, and have babies with. She’s the queen of Damsels In Distress. Very problematic subtext if you ask me. I estimate she only has 1% agency in the entire film. In fact, there are secondary characters who are more three-dimensional than Eden. Her diminished characterization doesn’t make any kind of strategic sense when one is attempting to entertain with an SFR. Once the hero loses the heroine, the film focuses on his effort to reunite with her. She develops amnesia (a regular romance trope, it should be noted), which presents another roadblock to her reunification with the hero. The romance heat level is 100% sweet, by the way. There’s kissing and hugging. I didn’t mind that, but I also think their sexual journey was another aspect sacrificed for the sake of the visuals. Even a brief, modest love scene would have gone a long way toward developing the romance better. As the hero attempts to reunite with Eden, the tension and conflict levels are very low. Lots of screen time is devoted to Adam working on an invention that, if perfected, would change the dynamics and fates of the two worlds. Much of the film is this: he’s either working on his invention or running away from Up Above after one of his visits with Eden. “TransWorld,” which apparently rules Up Above, is a bland and ambiguous villain. Even in one scene where Adam was caught by some TransWorld goons, they let him go soon afterward. Less than a minute in terms of screen time, IIRC. The film ends on a strong note of “love conquers all.” Despite that hopeful theme, overall the film’s drama was sorely disconnected from the sparkly visuals. The SFR aspect was simply a hangar on which to prop them. 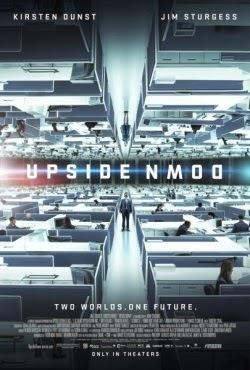 After I finished watching UPSIDE DOWN, I became really frustrated in light of its reported 50 million dollar budget. I know a mid-level budget for this kind of film is a guarantee of nothing, but we do tend to associate a higher price tag with higher quality (it’s a pedigree thing). UPSIDE DOWN represents a lost opportunity. Pretty visuals mean nothing in the absence of a compelling story. I can’t help but wonder how many good SFR films could have been made with those millions. I’d rather have a great story in a low-budget film than pedigree. As an SFR superfan, I feel burned by UPSIDE DOWN. I’m disappointed I couldn’t love this film.